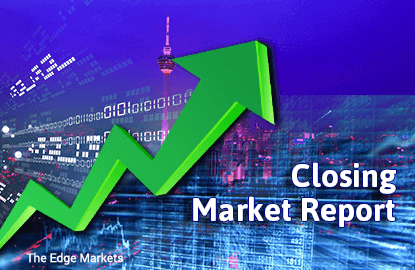 KUALA LUMPUR (Aug 1): The FBM KLCI rose as much as 0.8% today after the United States reported weaker-than-expected economic growth data, which reduces the chances of the nation increasing its interest rate. At the close of trading, the benchmark index pared some gains to settle at 1,665.23, up 11.97 points or 0.72%. The rise was in line with the uptrend in regional bourses. Japan's Nikkei increased 0.4% to 16,635.77, Hong Kong's Hang Seng rose 1.09% to 22.129.14, while South Korea's Kospi advanced 0.67% to 2,029.61. Reuters reported that Asian shares hit a one-year high today after the disappointing US economic growth data reduced expectations that the Federal Reserve will raise interest rates in the next few months. The US gross domestic product increased at a 1.2% annual rate in the April-June period, less than a half of a 2.6% growth rate economists had expected, it noted. Interpacific Securities Sdn Bhd remisier Sam Ng told theedgemarkets.com that the momentum is likely to continue tomorrow, driven by increasing interest from foreign funds in the Malaysian capital market. "The ringgit is very strong today, (appreciating) from 4.0660 (against the US dollar) last Friday to 4.0155, coupled with the higher KLCI. We suspect that it is due to strong entrance by foreign fund," he said. The ringgit was later trading at 4.0220 against the greenback and 3.0009 against the Singapore dollar. In the stock market, a total of 1.78 billion shares worth some RM2.02 billion were traded today. There were 426 gainers against 333 stocks that fell, while 366 counters remained unchanged. The top gainer was British American Tobacco (Malaysia) Bhd, while the biggest loser was Panasonic Manufacturing Malaysia Bhd. TH Heavy Engineering Bhd was the most actively traded stock, with 104.66 million shares done.